I read this article and found it very interesting, thought it might be something for you. The article is called The First Recipe From My Cookbook: Vegetarian Stuffed Grape Leaves and is located at https://www.anediblemosaic.com/the-first-recipe-from-my-cookbook-vegetarian-stuffed-grape-leaves/. Photo (taken by yours truly) of Vegetarian Stuffed Grape Leaves from my cookbook, An Edible Mosaic: Middle Eastern Fare with Extraordinary Flair. I am so excited, I have a real treat to share with you today. 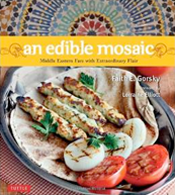 In a very special preview of my cookbook, my dear friend Nancy (of Spicie Foodie) shares the recipe for Vegetarian Stuffed Grape Leaves from An Edible Mosaic: Middle Eastern Fare with Extraordinary Flair. Her post is special to me for so many reasons. The recipe brings me back to the days when I was earnestly watching my mother-in-law, Sahar (which means “Aurora” or “Dawn” in Arabic), cook in her Damascene kitchen. Sahar cooks with all the grace of a ballerina performing, and at the end of the day she is proud to feed her family the fruits of her labor. In a way, seeing my recipe out there reminds me of all the hard work, late nights, early mornings, countless photo shoots, time spent learning the cuisine, joy it brought to me to be able to cook the food of my husband’s culture for him and watch him savor it, and heart and soul that went into my cookbook. Nancy, I am honored beyond words. Thank you. This is the first recipe being shared from my cookbook, and Nancy wrote a beautiful post to go with it (and there’s a step-by-step tutorial for making stuffed grape leaves!). Please head over to check it out. While you’re there, feel free to take a look around. Nancy is such a sweet, kind person, and one of the most talented bloggers I know. I gush about her captivating photography all the time (she is an endless source of inspiration! ), and I can’t wait for her photography eBook (you can read more about it here). Hope you enjoy it, and thanks again, Nancy! Faith those stuffed grape leaves are gorgeous. I have yet to try them, but they are on my list. Congrats on the book, I’m sure it’s amazing your photos are so captivating. Just like Miss Nancy’s amazing work. So exciting indeed to see this first recipe. this is a favorite recipe for me too. Off to check out Nancy’s post. That was a great review Faith! I’ve never had grape leaves before but you make them look fabulous! Yay! I love stuffed grape leaves-heading over to check it out! It has been such an honor being able to host a preview of your book. I am so happy for you and your beautiful cookbook. This post is so lovely because when I first saw the preview you sent, I immediately imaged what went into creating your book. Really looking forward to reading your cookbook cover to cover. Of course I don’t have to tell you that I’m also looking forward to cooking from it. Love stuffed grape leaves. Off to check it out. OMG Faith I am so excited!!!!! And this is one of my favorites, which I have never made at home before. Heading over now…. What a lovely intro to your cookbook, Faith! Such fun to read and fun to see the sneak photos of your recipes! I am so happy for you Faith! The grape leaves look amazing! I already checked out the post earlier – lovely. I loved those when I tried them in Greek restaurants! We love grape leaves. On my way to check out Nancy’s post. Excited about your cookbook. Hearty congratulations! You are such an inspiration my dear. Ryan loves stuffed grape leafs, and I would love to make them for him in the near future.